Jesus freak Hideout (Scott Fryberger): So how's everyone doing? Tedashii: Food? Can they ask about food now? Sho: Food's fine. But not that other stuff. Now if you wanna ask about politics or something, we'll answer those questions. JFH (Scott): I think that's all that I wanted to ask about, actually. Sho: Cool, then we're good. JFH (Scott): Where did you guys come from? Like, where did you play last night? Sho: We drove to San Antonio last night from Columbus. The Discovery Camp or something like that. Flame: It's all starting to run together, man. JFH (Scott): I've never heard of Discovery Camp. JFH (Sharie): I've heard of that. Sho: See, she's heard of it. She's raising her hand over here all shy and stuff. You're the one who knew all the answers in school but didn't wanna answer them cause you didn't wanna show off huh? Sho: 'Crae, are you trying to take a picture of your eyes? Lecrae: I'm trying to see if my eyes are red. Sho: You want someone to take a picture for you? Trip Lee: I bet we look like some weirdos to you guys. JFH (Scott): Oh, no it's cool man. So, except for Flame, you're all on Reach Records right? JFH (Scott): How long have you been with Reach? Sho: Um...that's a pretty interesting question. The label itself? I don't know. Probably all of us have been... well, I've been there the shortest amount of time contractually, which is only two years, but I don't really see Reach as a record label. I see it more as a family, and we've all known each other, some of us, as long as eight years. So yeah, we all started off, and as soon as we met Trip, it was kinda like family too, so we've known each other for - most of us have known each other for five years I think. JFH (Scott): And how long have you been with Cross Movement Records, Flame? Flame: I think I've been with Cross Movement now for, let's say, four and a half years? Going on five, I believe. Something like that. JFH (Scott): And this tour was inspired by a certain book, is that right? Lecrae: Well, I would say more than a book. The tour was really inspired by just a perspective, a way of life, and that is to see that Jesus' death and resurrection is so pertinent to our everyday living that to not take that into consideration as you live would be to waste your life. Sho: But the author of the book is John Piper. Lecrae: Oh yeah, my bad. Trip Lee: We took that name and that phrase [Don't Waste Your Life] that represented that lifestyle that we see in the Scriptures kind of as a slogan for this tour. JFH (Scott): And how did the line up come about with you five? Sho: We're all just friends. Same hearts and everything. 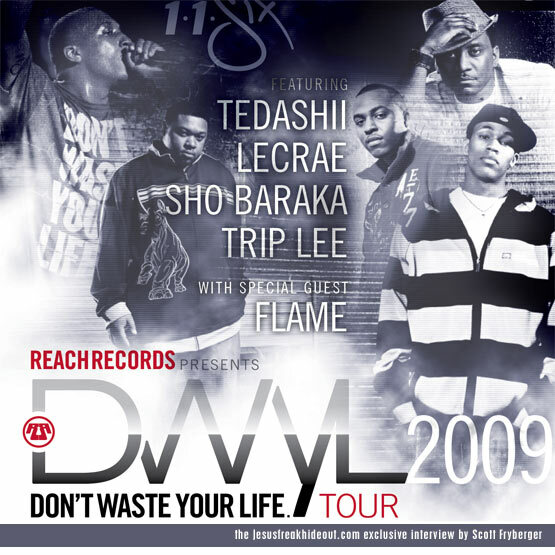 Trip: Reach Records is just us four [Trip, Lecrae, Sho, Tedashii], and last year we did a tour, The Unashamed Tour, with just us four, real excited to travel with one another as like-minded individuals. So the Lord just kinda brought all of us together as family, and then Flame has been a brother that we co-labored with and loved and been a good friend of ours for a long time, like-minded as well, so we wanted to bring him along, and wanted to bring people along who were living a lifestyle that we were pushing for. Sho: And he's a pretty good artist. I guess that doesn't hurt. Trip: Yeah, he can rap. Flame: Thank you, thank you. JFH (Scott): How many cities have you guys been to on the tour so far? Lecrae: Twenty-seven. Er...I don't know how many we've been to, but the tour is twenty-seven cities. Sho: I think we're about halfway through. We still got Chicago, Phoenix, New Mexico, so yeah, we're about halfway through. JFH (Scott): Anything really memorable that's happened so far? Or any favorite venues or anything? Sho: The next venue is always the favorite. *pause, Trip whistles* I know, that's deep right? JFH (Scott): I'm still thinking about it. Flame: I think I really enjoyed Minnesota. There was a sold-out venue, but I think the people that came were the people that wanted to be there. You can kinda tell when someone has to maybe force people to come to a concert, or they try to do an evangelistic event and we're kinda new to everyone and trying introduce ourselves and the gospel, but this event, it just seemed like a room full of people that had a relationship with the Lord, had been exposed to Christianity, were excited about the music and ultimately the Gospel, so that was something that stuck in my mind. JFH (Scott): I really enjoy that you guys are able to share the Gospel through hip hop, which is a form of music that a lot of people in the church don't really agree with or they claim it's ungodly, and stuff like that. Have you ever been tempted to just give up because of that? To just stop making hip hop? Lecrae: No, not at all. Personally, I haven't caught the flack. Like, we haven't felt it. So... I mean, I know some people have, and I think the forerunners - the people that have been out longer than we have - have probably dealt with a lot of the blows, but we're at a place where we don't feel it like they did. Sho: So now they can exploit it more. Yeah, well some people can. *laughter* Four of the five here can. So yeah, you see it exploited a little bit more, and churches are using it now - not just churches, artists too - and fans are using it for reasons that may not be the most beneficial for the Kingdom of God. JFH (Scott): Just to glorify worldly stuff. Trip: It's like it's the tight thing to do if you're an urban Christian. Sho: Or you're a male. It seems like if you're a man, a lot of times in the church if a role for you is not a pastor, "Well, what do I do? Oh, well, I'll be a rapper." And that just seems like the next best option. Trip: And I'll just say real quick, I think, even if we face the kind of opposition incredibly, the way a lot of people have in hip hop in general... I mean, all of us are very convinced by the Scriptures and by what the Lord calls His people to do. I think we're convinced enough that this is a good way to spread the gospel and the Lord desires missionaries to every kind of people. I think that we're convinced of that enough and we know that hip hop isn't demonic. I think we're convinced enough of that that it wouldn't shake us and we just wanna point people to the Scriptures that show them that their way of thinking isn't in line with the Bible. JFH (Scott): What have you guys been reading in the Bible lately? Trip: I'm personally studying 2 Corinthians. It's an encouragement, especially during tour times because so much of it has to do with Paul and his own life of ministry, and I'm reminded of a lot of things, from the integrity of his ministry to his mindset in ministry to his heart toward the people that he's ministering to. So that's been a huge encouragement to me during this tour. Flame: I'm just trying to read from Genesis to Job this Summer. So I'm in the Old Testament just looking at the character and nature of God, and how He worked in the lives of His people, His sovereignty, power, strength, holiness, so I'm just getting it in that way. Tedashii: I'm reading the gospel of John. I think it was encouraging for me as a married man. My wife and I have been married three years, and I don't know if it's true that everyone has the honeymoon phase, but I feel like for us, I mean, we just enjoy one another a lot, but I wanna see the Gospel and the preciousness of Christ permeate my marriage, throughtout all of it, and in my own life. And so, for me, just watching Jesus live and walk through that Book has been amazing. I'm currently in chapter nine. The blind man, it's awesome. Sho: I'm reading the book of Leviticus. And I'm doing that just to see if I'm a Christian, if I can make it all the way through. *laughter* That's the only reason why I'm doing it. I think there's a lot to learn in the Levitical Law, a lot to learn from the feasts and sacrifices and how we can relate that to how there's a parallel to Christ being our first fruit and our sacrifice and everything. I've never been able to get through Leviticus and so there's something to say about that in itself. So for me, it's a challenge in [not only] to have the discipline to read through it, but also to be able to learn and kinda bring the distinctions of those laws and those statutes in relation to who Christ is. For me to better understand who Christ is. Lecrae: I'm going through the Gospels this Summer. I finished the book of John, I'm in Luke, and I guess I'm not looking for anything specific. I'm just allowing the glory of the Lord to come and just wash over me. I just want Him to reveal His glory to me. So that's what I'm doing. JFH (Scott):Now, you've all released albums within the last year or so, approximately. Flame and Trip, I think you have the oldest of the albums out now. What have you guys been up to since then? Flame: Well, I've been in school and been really enjoying that. I'm in Louisville, Kentucky at Southern Baptist Theological Seminary's Boyce College studying Biblical counseling. So just grinding it out in school. My wife and I are traveling every weekend, I'm enjoying that, and I'm taking down ideas for a new album, and I'm hanging out with these guys as we're touring too. I'm staying busy. Trip: I'm in school as well. I'm in Philadelphia Biblical University in Philadelphia. I'm majoring in Biblical studies there. Um... I'm trying to get a better grasp of the Scriptures so I can know God better and point other people to Him. I'm also serving in my church in Philadelphia, and just got married recently as well. JFH (Scott): Any good CD's you've been listening to lately? Sho: Tedashii's! Yeah, Identity Crisis. It's wonderful. JFH (Scott): I know you've all had kind of a rough day [with the bus breaking down], so I'll cut it short here, but do you have any words of advice for anyone who might be reading this or any aspiring young rappers? JFH (Scott): That's always good advice. Lecrae: "Aspiration" is kind of an interesting term. The Bible talks about selfish ambition, and what is your motive behind it. I guess ultimately if your desire is to demonstrate how worthy, valuable, how incredibly great and magnificent Jesus is, then you will be satisfied doing it in whatever capacity that you've been gifted to do it in, whether ten people listen to it, watch it, see it, or ten thousand. So I guess I'll just say be content with magnifying God in whatever capacity. Sho: I'll say also that a lot of times in what we do we don't emphasize the importance of the church, and I think it's very important that we as young individuals who are gifted, young, have a lot of time and talent, dedicate our time to the church. Not just time in a sense of just attending, but trying to be a vocal part of what the heartbeat of the church is. And so giving our time and our treasure and our talents to the church, and being committed to the authority that God has placed in the church and not always trying to do things on our own because other people don't necessarily do the things in the ways we'd like to do them. But being committed to your local church is something I think is real important. Tedashii: Plus, I would like to share, and I think this is something that God has really been impressing upon my heart, and I think people see this as a right, like they deserve this, like "I'm tight, I'm good, I do it here locally, so why not be..." and for me personally, this entire summer, to me, has been seen as such a privelege, that the Lord would allow this, in this fashion. I think a lot of times it can be easy because of the platform you get, sometimes that people take it for granted. Though that can sound cliche, it seems almost as if you deserve to get something, and, for me personally, it was a privelege that God opened my eyes to the Gospel. It's a privelege that His grace and mercy was huge enough, it's a privelege His Son died... So much stuff is blowing me away, the fact that I'm undeserving of anything. So hopefully people start to see that it's a privelege to live for the Gospel and to live for Jesus, to know the Lord and the pardon of your sins. And so that, for me, is a motivation to be involved in my local church. It's a motivation for me to throw aside my own personal ambitions and just seek God's face and for what His heart would have me for here in this world while I'm here and not waste my life.